In stock -This product will ship today if ordered within the next 14 hours and 9 minutes. This natural baby lotion is made without Parabens, Lanolin, phthalates, artificial perfumes, petrochemicals and colourants to bring you the purest moisturiser that nature can offer. Aqua , *Helianthus annuus seed oil, *Prunus armeniaca kernel oil, Cetearyl glucoside, Cetearyl alcohol, ^*Butyrospermum parkii butter, ^*Theobroma cacao butter, *Calendula officinalis extract, Glyceryl stearate, Levulinic acid, *Aloe barbadensis powder, Sodium stearoyl glutamate, Sclerotium gum, Xanthan gum, ^Commiphora myrrha) oil, Sodium citrate, Potassium sorbate, Citric acid. 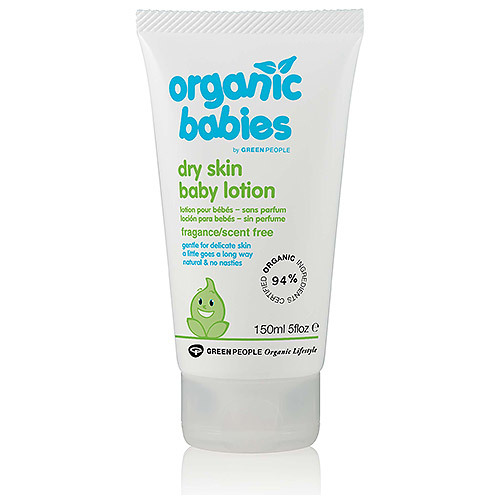 Below are reviews of Green People Organic Babies - Dry Skin Lotion - 150ml by bodykind customers. If you have tried this product we'd love to hear what you think so please leave a review.